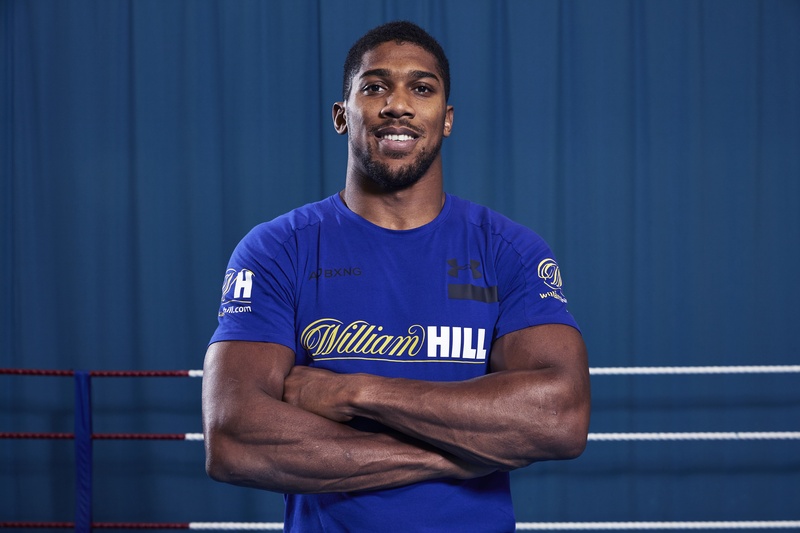 William Hill Global Brand Ambassador Anthony Joshua puts his IBF, IBO, WBA and WBO world heavyweight titles on the line against Alexander Povetkin this Saturday and you won’t find a better price on round betting than ours between now and the opening bell. Our traders go just 1/9 about the Briton’s latest fistic endeavour ending in identical fashion to his previous 21, with his hand raised in victory at the end of the fight. Looking into the Anthony Joshua round betting is one way of wagering on the Watford warrior at more rewarding odds and nowhere will you find a better price on your selection than William Hill. 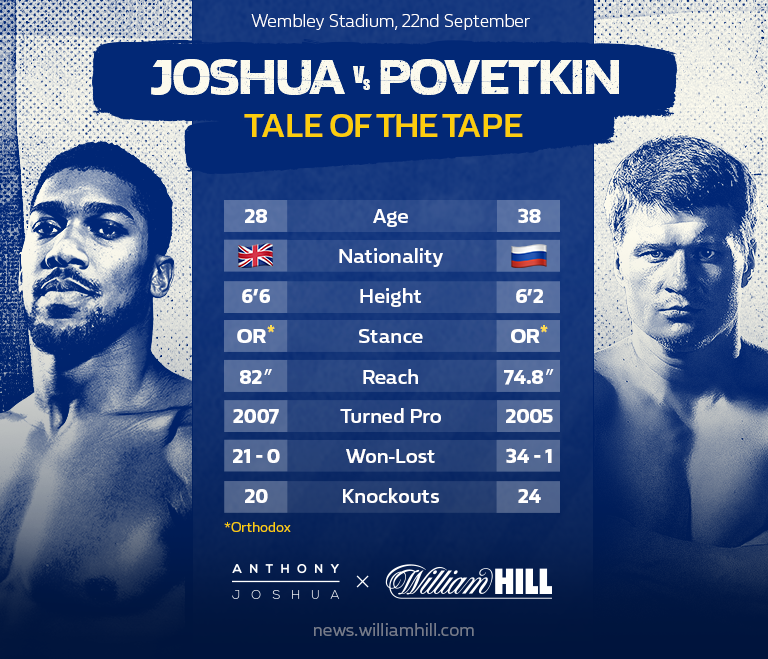 Anthony Joshua vs Alexander Povetkin, the numbers behind the fight. The White Lion’s name may not have the same blockbuster prestige as an AJ, a Tyson Fury or a Deontay Wilder, but the Russian has nonetheless amassed an impressive professional CV. His sole defeat in 35 paid outings came at the hands of Wladimir Klitschko. Povetkin took the then multi-strap world boss the full 12 threes in Moscow in 2013, despite being ‘knocked down’ four times in a match where his larger foe was given free rein to push him around and lean on him by a lenient referee. That resilience suggests that any Anthony Joshua round betting predictions ought to zero in on the latter stages of their Wembley Stadium encounter. Joshua’s last three fights have gone at least 10 rounds and it’s difficult to see this one failing to follow suit given the elusiveness and clever angles he can expect from his challenger, who was 2003 world amateur champion and won Olympic gold a year later. Encouragingly, after the 10/1-rated middle rounds, the Anthony Joshua round betting odds start getting longer again from the ninth onwards. AJ in round 10 is betting at 16/1, while a win for the Briton in round 11 is projected at 22/1 and a 12th-round finish in his favour is the 25/1 outsider of all possible results in which he prevails. Shortest of all in the round odds is a Joshua points victory at a forecast 3/1, which is where William Hill’s top price pledge on round betting comes in, ensuring you get the best odds about AJ coming through on the judges’ scorecards upon the conclusion of 12 rounds of thrilling heavyweight boxing. On home turf, with bouncebackability proven in the wake of his own epic tussle with Klitschko the younger, it’s difficult to see a verdict going against Joshua. Meanwhile, the measured, low-risk manner in which he outpointed another smaller, elusive fighter in Joseph Parker last time out suggests he’ll be in no rush to be rash against an adversary who, in 2015, took 40 seconds less to KO Carlos Takam than AJ himself when he met the Frenchman last year. Click here to read our Anthony Joshua vs Akexander Povetkin odds. You won’t find a better price on round betting in the Anthony Joshua v Alexander Povetkin fight on Saturday 22nd September. Listed below are the significant conditions of the offer. Top prices from 9am Friday 14th September 2018 until the start of the fight. Online price comparison with Bet365; Paddy Power; BetVictor; SkyBet; Ladbrokes; and Coral. In-shop price comparison with Ladbrokes; Coral; and Betfred. Price comparison does not include any price boosts, enhanced odds or any special offers from competitors. We are not obliged to match a price if it is bigger than the ‘lay’ price on exchange sites. Please visit our promotions page for full terms and conditions of this offer.